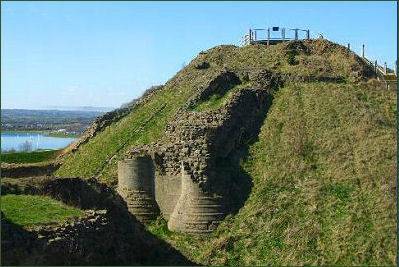 The ruins of Sandal Castle overlook the River Calder at Sandal Magna, a suburb of the city ofWakefield. 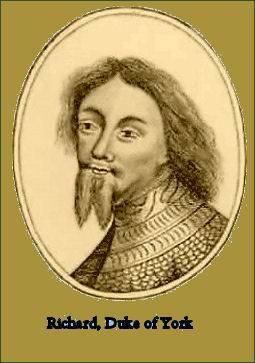 Henry I granted the Sandal estates to his cousin William de Warenne, 2nd Earl of Surrey (1081-1138) in 1107. Warenne constructed the first Sandal Castle of timber. 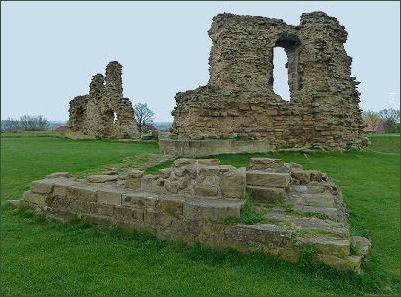 King Edward III granted Sandal to his fifth son Edmund of Langley, Duke of York, Sandal Castle was inherited by his son Edward Duke of York who died at the Battle of Agincourt in 1415. Sandal was then inherited by his nephew, Richard Plantagenet, 3rd Duke of York. Richard of York laid claim to the throne in 1460, an action that precipitated the Wars of The Roses. His claim was based on the fact that by the strict rules of primogeniture, his descent from Lionel of Anwerp, second surviving son of Edward III, was superior to that of the throne's Lancastrian occupant, Henry VI, who descended from Edward's third surviving son, John of Gaunt. Eventually, an Act of Accord was agreed in October 1460 which recognised him as heir to the throne and named him Protector of the Realm. In December Richard travelled north to Sandal Castle, intending to spend Christmas there. Henry VI's strong willed queen, Margaret of Anjou, however, would not meekly accept the disinheriting of her son Edward, Prince of Wales. On the morning of 28 December a Lancastrian force marched out from Pontefract to confront him, York was aware that Lancastrian armies were in the area and sent for aid to his son Edward, Earl of March, but before any reinforcements could arrive, he inexplicably sortied from the castle on 30 December. The reasons behind York's rash act will never be known or fully understood. A theory was later recorded in Edward Hall's chronicle, written just a few decades after the event, but deriving partly from contemporary sources, was that in a plan devised by the wily Andrew Trollope, part of the Lancastrian force, headed by the Duke of Somerset and John Clifford, Baron de Clifford or or 'Bloody Clifford' as he was sometimes known, advanced openly towards Sandal Castle, while further forces led by Ros and the Earl of Wiltshire hid in he woods surrounding the castle. York may have been low on provisions in the castle and believing that the Lancastrians were apparently no larger than his own force, decided to go out and fight rather than withstand a siege. The battle lasted less than an hour, the Duke of York was slain in the melee, it was said that he went down fighting with his back to a clump of willow trees. His seventeen year old son Rutland, who had fought by his father's side, fled to escape over Wakefield Bridge, but was overtaken and killed, probably by Clifford in revenge for his father's death at St Albans. After the battle Margaret of Anjou had the heads of York, Rutland and his brother-in-law, Richard Neville, Earl of Salisbury impaled on spikes and displayed over Micklegate Bar, the western gate through the York city walls, York's was crowned with a paper crown in derision. Only two months later Richard's eldest son Edward, Earl of March was crowned as King Edward IV. York's youngest son, King Richard III made Sandal Castle his chief stronghold in the north, adding the polygonal tower to the keep and providing a new bakehouse; the walls of both buildings are still visible today. During the Civil War Sandal Castle was held by the Royalists, although its neglected state left it out of the major conflicts. In 1645 however it was besieged at least three times by Parliamentarian troops. By the end of the siege the castle stood in ruins and was later slighted by Parliament. A wooden walkway was constructed to provide access to the summit of the motte in 2003 and a visitor centre was built about 100 metres from the castle.